A market town in the Lake District, Keswick has Medieval roots and sits just in from the northeast shore of Derwentwater, a lake of staggering beauty. The lake is in an awesome crucible of hills that you can climb directly from the town, while the Derwent Launch will whisk you off on a cruise. Keswick’s story begins long before the first tourists showed up in the 18th century. 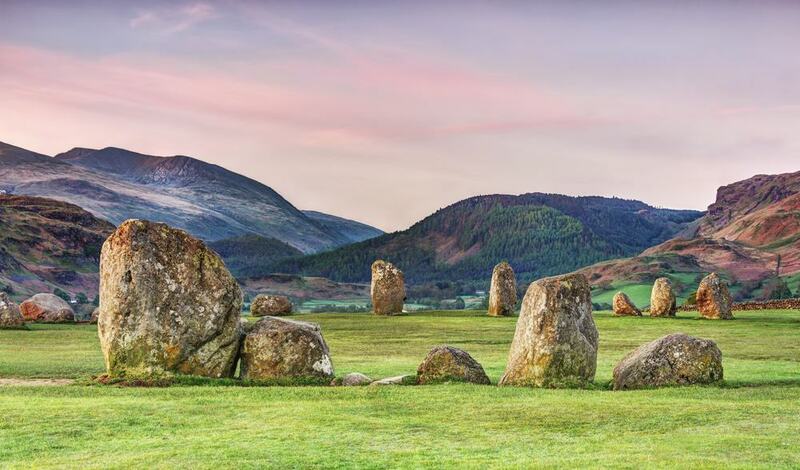 The Castlerigg Stone Circle is up to 5,000 years old and the town’s market has been trading since the 1200s. In the 16th century an extremely pure deposit of graphite was discovered in nearby Borrowdale, and for the next 100 years Keswick would monopolise Europe’s pencil industry. The Derwent Cumberland Pencil Company still has ties to Keswick and runs a museum in the town. 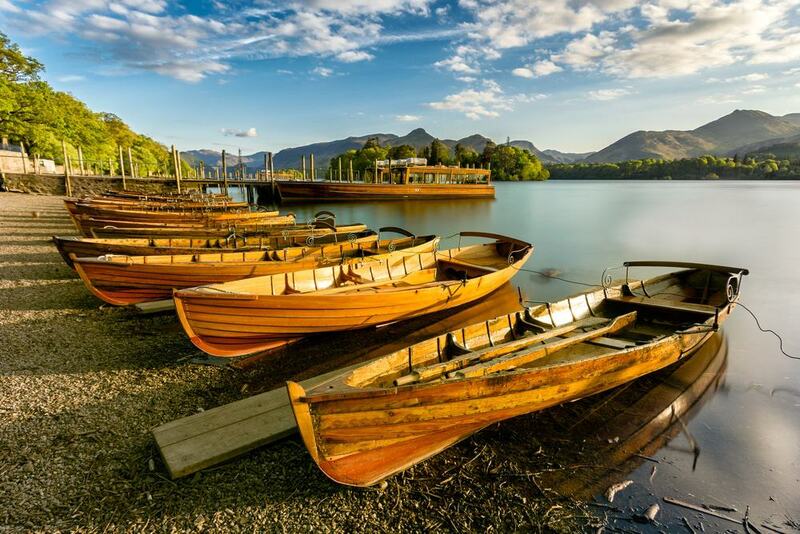 Ten minutes on foot from the town centre, Derwentwater is Keswick’s headline attraction and has a shoreline mostly managed by the National Trust. The lake is roughly three miles long, with an eight-mile perimeter trail that you can do in half a day. Try to get up early on a clear summer’s morning to grab a photo of the lake’s mirror-like sheen, and don’t pass up the chance to take the 50-minute cruise on a Derwent Launch. Derwentwater has four main islands, one of which, Derwent Island, has an 18th-century Italianate house. The lake’s sense of drama comes from its mountainous borders and the epic hollow of the Borrowdale valley, which unfolds to the south. The children’s author and illustrator Beatrix Potter spent nine summers at properties at Lingholm and Fawe Park, two estates on Derwentwater’s northwestern shore. It’s hard to conceive of a prehistoric monument in a more sublime location than the Castlerigg Stone Circle. Standing here, surrounded by the formidable fells of Skiddaw, Blencathra, Castlerigg Fell, High Rigg and Clough Head, you can understand how prehistoric inhabitants might have concluded this was a very important place. Castlerigg is thought to have been a gathering place, where groups journeying from the coast in the west and the Eden Valley in the east would have met on their way to axe factories and summer grazing in the Lake District’s central fells. The circle is one of the earliest in the UK, between 4,000 and 5,000 years old and made up of 38 standing stones up to three metres high. 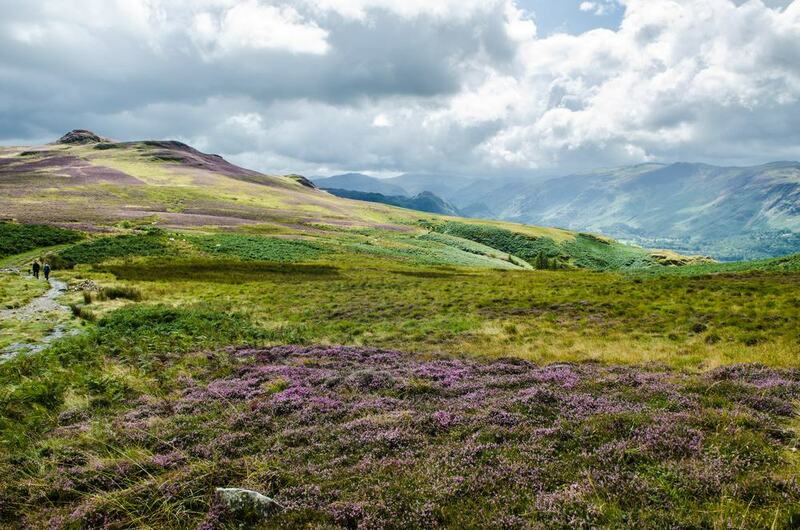 On Derwentwater’s western shore is one of the Lake District’s most treasured fells. At 451 metres, Catbells has a modest height and a moderate grassy slope that can be tackled by walkers of almost any age and fitness. You can crest Catbells on a circular trail that climbs from the lakeshore and takes around three hours to complete, depending on how often you pause to soak up the landscapes. 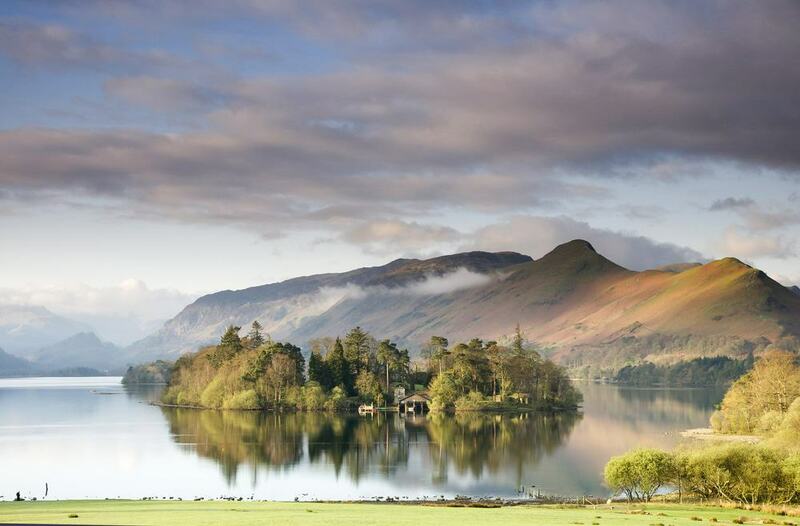 From the top you’ll be wowed by clear panoramas of Derwentwater and its islands, along with Keswick’s townscape, Borrowdale to the south and Skiddaw to the north. Catbells is just one peak on a long ridge down the side of the lake, so you may be tempted to stay on the trail and add a couple more hours to your hike. 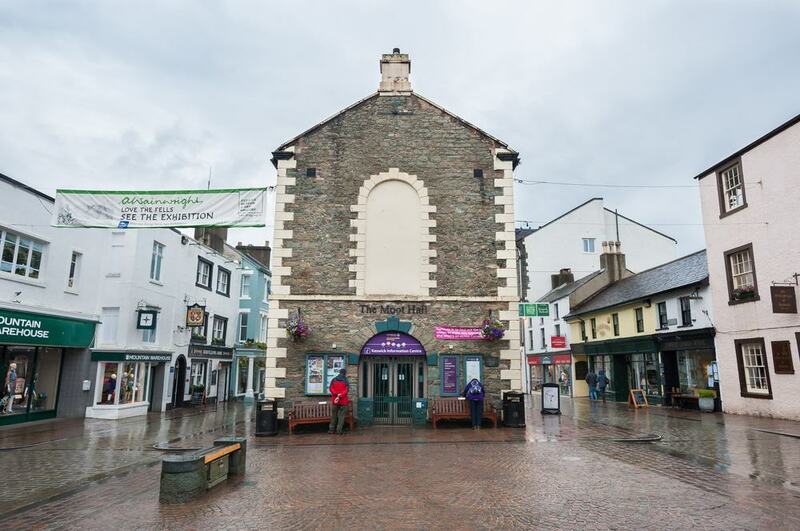 The town’s museum dates from the 19th century and bounced around a few venues in Keswick like the Moot Hall, before arriving at this purpose-built in 1898. The museum reopened in 2014 after an 18-month refurbishment backed by the Heritage Lottery Fund. It has earned a reputation for its peculiar exhibits. One is the Musical Stones of Skiddaw, an eight-octave lithophone (rock instrument) using pieces of exceptionally hard hornfels, a metamorphic rock quarried on Skiddaw. Queen Victoria sat for a performance on this instrument. Some other curiosities are a teacup owned by Napoleon, a mummified cat more than six centuries old, a line-up of mounted taxidermies and a man-trap for catching poachers. When this article was written there was a superb exhibition about women mountaineers in the 19th century, and how they had to overcome both natural and social barriers. 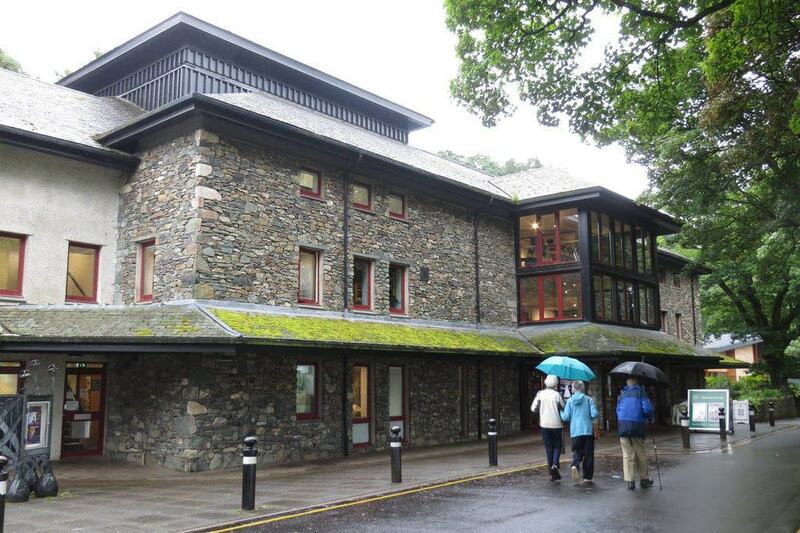 You may not expect to encounter such a highly-regarded theatre in a place as remote as Keswick. But the Theatre by the Lake, moments from the shore of Derwentwater, has a resident company of up to 14 actors, performing a repertoire of six plays during the season, from May to November. The theatre also produces one new play every year, and the Theatre By The Lake’s Christmas productions are a family treat in December. Along with these home-made productions, the theatre also hosts local events like the Keswick Beer Festival and the Keswick Mountain Festival, both in June. 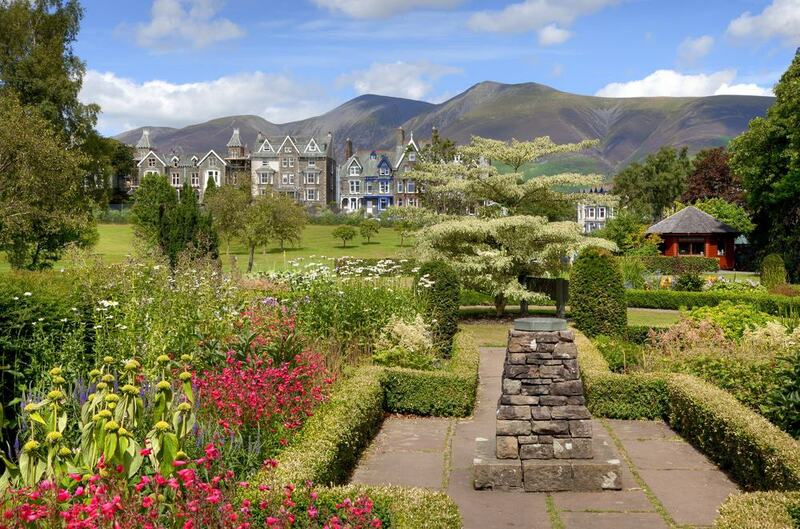 Between Keswick and the lake, Hope Park is a mosaic of gardens and family leisure facilities. The park takes advantage of the majestic scenery on Derwentwater, and in the 19th century was empty space, grazed by the horses that pulled the coaches carrying tourists from the train station to Keswick’s hotels. The park was landscaped in the 1920s by the landowner Sir Percy Hope, and the sweet ornamental garden on the west side was once his wife, Lady Hope’s private garden. Hope Park has free Wi-Fi remote-controlled boats, a woodland walk and a picnic area, together with crazy golf, an 18-hole putting green and a nine-hole pitch and putt course. Keswick has big graphite deposits that have been exploited since the 16th century. Pencil -production started on a small scale, but burgeoned into the 19th century and soon became industrialised. The factory for the Derwent Company opened in 1832, and the company was here until 2007 when the base was moved to Workington. The Pencil Museum has a reproduction of the Seathwaite Mine where graphite was found for the first time in the 1550s, and charts the history of pencil-making in the town. There are pieces of vintage pencil-making machinery, as well as an explanation of how pencils are manufactured in the 21st century. The museum also possesses the largest colouring pencil on the world, produced in 2001 and measuring a little under eight metres long. 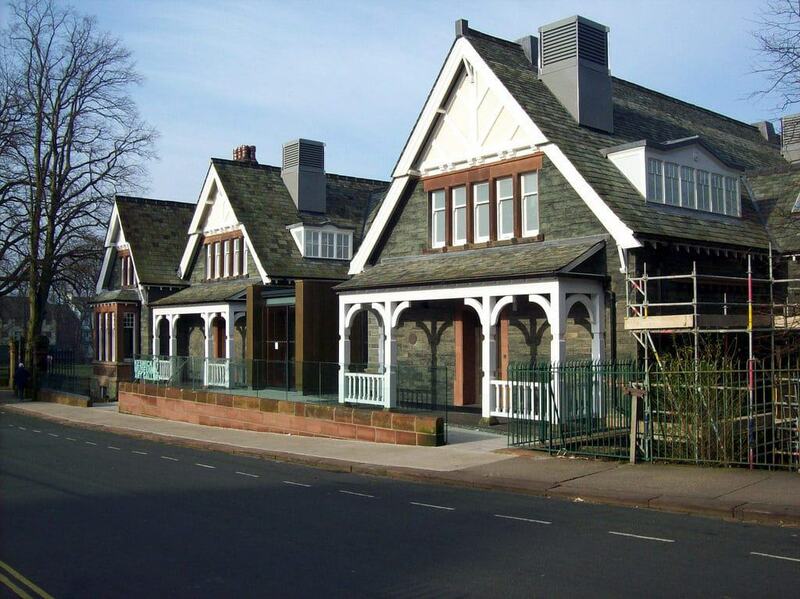 A focal point of the town, the Moot Hall is an assembly building fronting Keswick’s Market Square. The Moot Hall has slate walls and dressings and quoins painted with lime-wash. The building standing here now is from 1813, but there has been an assembly hall/courthouse on this plot since the 1570s. The bars on the windows on the ground floor suggest that the Moot Hall may have been used as a prison at one time, but for much of the 19th century the hall contained Keswick Museum. The ground floor now has Keswick’s Tourist Information Centre, and upstairs is a gallery for temporary art exhibitions. Derwentwater’s neighbouring fells are particularly beautiful from lake’s surface and deserve to be enjoyed on a cruise. The Keswick Launch sails from the Keswick Jetty 13 times a day (six clockwise and seven anticlockwise). The cruise lasts 50 minutes and makes eight stops around the lakeshore, giving you the chance to get off at a beauty spot for a picnic or visit landmarks like the Lodore Falls, the Lingholm Estate (Beatrix Potter spent holidays here) or the picturesque Ashness Bridge. There are four different launches, and each one has both open and covered decks, depending on the weather. 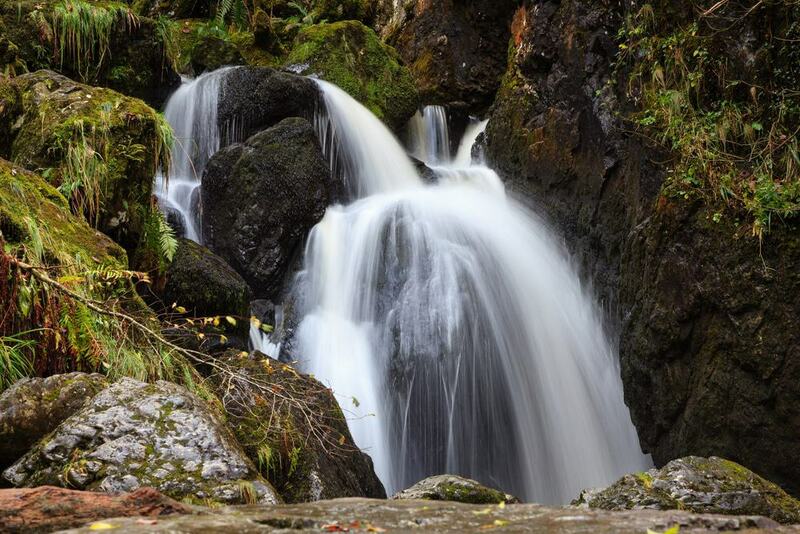 Behind the hotel of the same name, the Lodore Falls drop 30 metres down a steep cascade from the Watendlath Tarn to the Borrowdale Valley. The waterfall was first put on the map by Victorian tourists and is all the more spectacular for the huge boulders along the beck. Lodore Falls is one sight better visited in winter, when there’s a real torrent roaring over the rocks, while after prolonged dry spells in summer the flow doesn’t quite have the same majesty. The sight is on private property, in oak woodland that is Site of Special Scientific Interest. You can leave a donation for upkeep in an “honesty box” on site. Another Walk that you begin in Keswick meanders to the top of this 380-metre hill, right on Derwentwater. 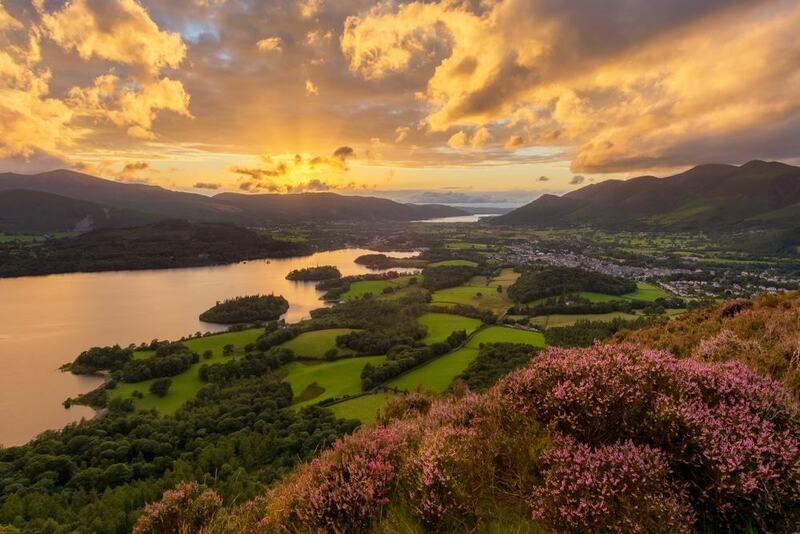 Walla Crag can be done in an afternoon or evening, as the summit faces west, so you can see the sun go down over the lake and its islands, as well as Grasmoor and Grisedale Pike. Even on warm days Walla Crag is an enjoyable walk as the trail wends through deep and cool coniferous woodland, opening onto a bare andesite lava crag in a bed of heather. There’s also a supreme view south along Borrowdale towards the highest peaks in the Lake District, like Scafell Pike and the Great Gable. 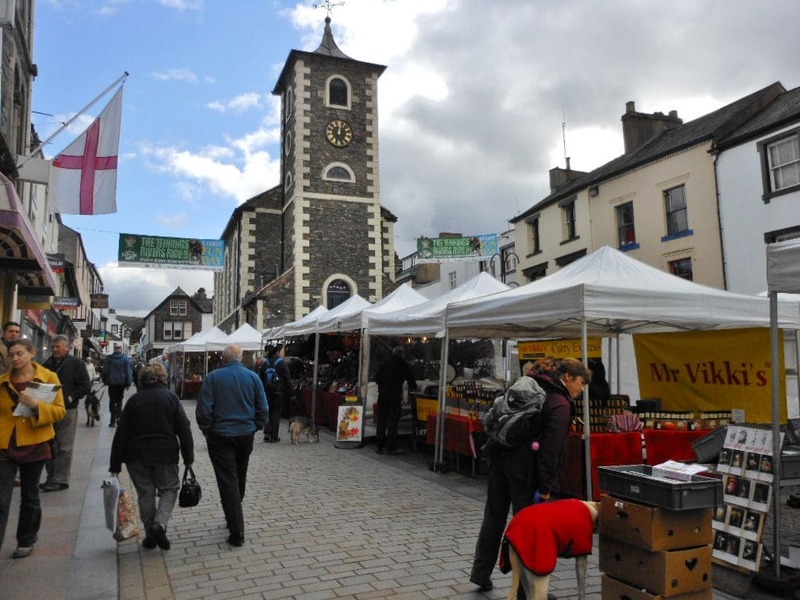 You can tell that Keswick’s sociable weekly market is high-quality because of the amount of locals who shop there along with the tourists. The market has been trading for more than 740 years in was crowned as “Best Outdoor Market in the UK” in 2015. On Market Square in front of Moot Hall, the market trades year-round on Saturdays, but also on Thursdays from February to December. Shop here for fruit and vegetables, homemade jams, fresh bread local meat, fresh herbs, specialty foods, second hand books, jewellery and arts and crafts. The only real mountain forest in England is a couple of miles out of Keswick and is an award-winning attraction. 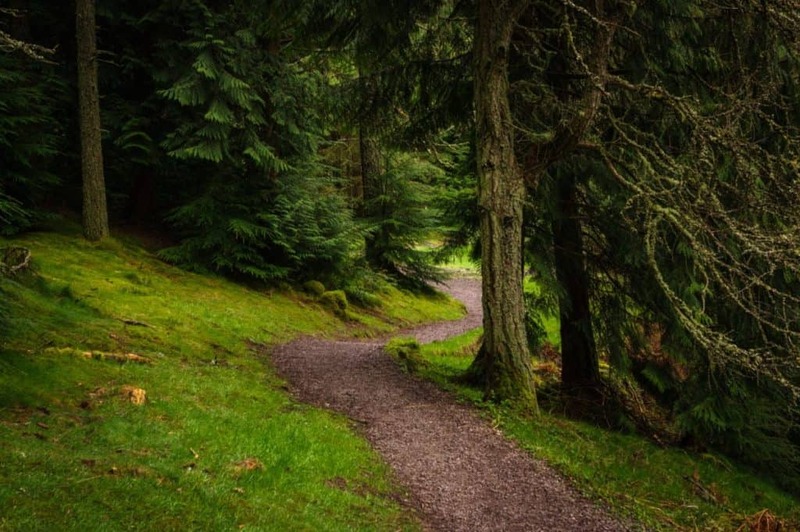 The Whinlatter Forest was planted after the First World War to make up for the UK’s timber shortfall, and after a lot of love and care has been turned into a park, coursed by waymarked trails. One, Wildplay, is a 600-metre path with nine different play areas with climbing features, a zip-line and a long slide. At the Visitor Centre you’ll be able to watch live footage from osprey and red squirrel nests, and find out more about these species. 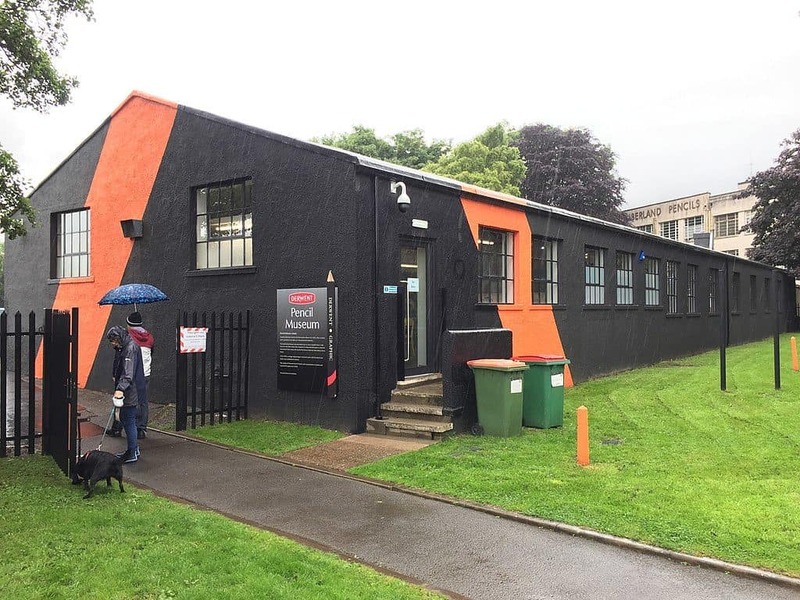 The centre also rents out mountain bikes, and occasionally on the trails the trees will part and you’ll get spectacular glimpses of the Northern Lakeland’s fells. England’s largest whisky distillery is in a startlingly beautiful spot on Bassenthwaite Lake, under Skiddaw, one of the Lake District’s highest peaks. The distillery is housed in a Victorian model farm, with a former barn and cattle sheds converted into the mash house, still house and the warehouse where the whisky matures. On a tour you’ll get the lowdown on how malt whisky is made and see the artisan-scale copper stills used in the process. The Lakes Distillery also produces vodka and gin, which you’ll be able to taste, along with the whisky, at artisan bar at the end of the tour. For water activities in a jaw-dropping environment you can make for the Derwent Water Marina. There on the lake’s north shore you can take courses in water activities like sailing, windsurfing, canoeing, stand-up paddleboarding and kayaking. The marina also provides “ghyll scrambling” which entails putting on a helmet and lifejacket, and descending the Stoneycroft Ghyll, a mountain stream that gushes down rapids and waterfalls in the Newlands Valley just west of Derwentwater. If you’re up for a self-guided adventure, the marina hires out canoes, paddleboards, windsurfing boards and laser 1 and 16 sailing boats.